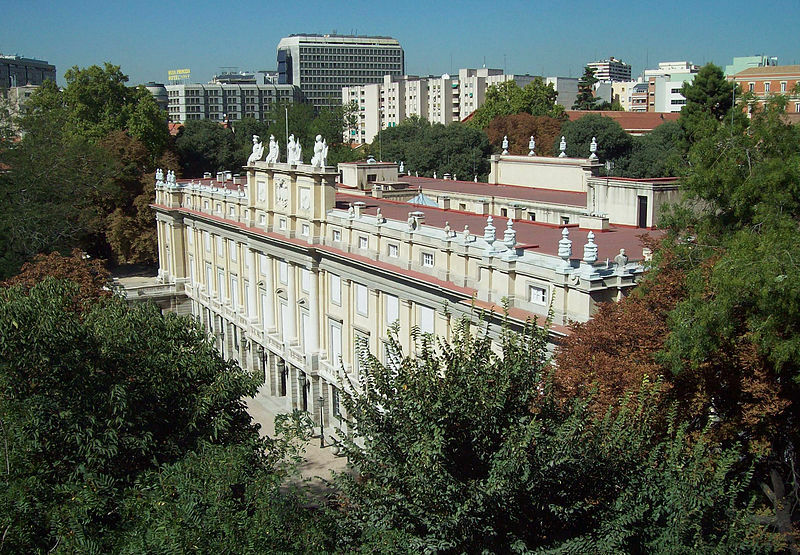 also known as Liria Palace, Madrid, Spain. Photo by Ricardo Labougle via World of Interiors. 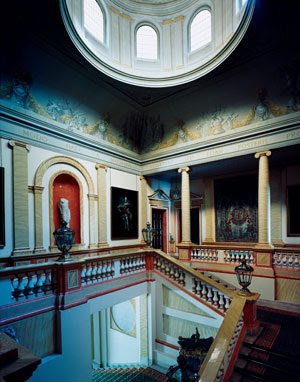 Catetana Fitz-James Stuart was born at Palacio de Liria, the family palace in Madrid, Spain, in 1926. With more than forty noble titles recognized by an existing government, and 150 hereditary titles, she holds the current Guiness World Record for nobility. 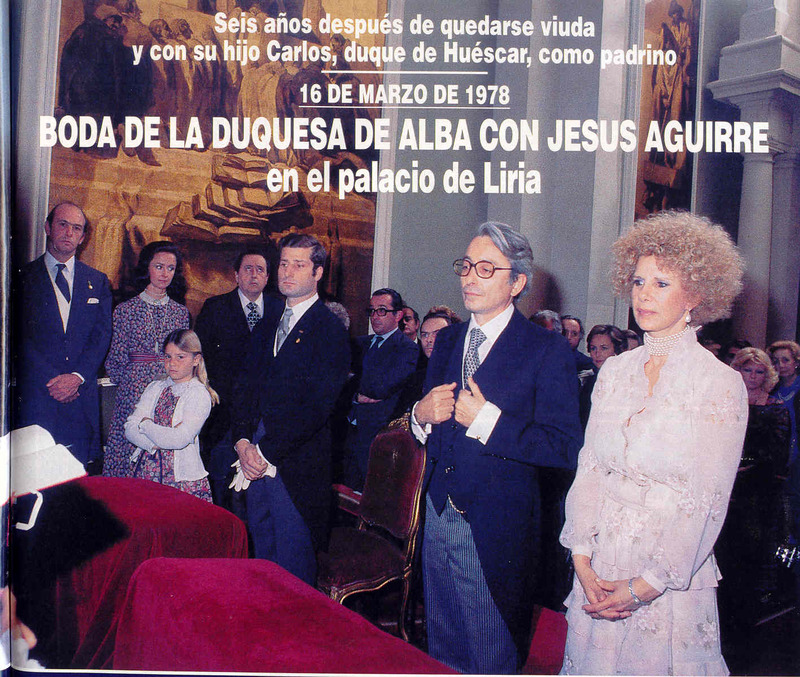 Her senior title is Duchess of Alba. A bird's eye view of Liria Palace, Madrid. The only child of the 17th Duke of Alba, Jacob Fitz-James Stuart y Falco, a diplomat, and Maria del Rosario de Silva, 9th Marchioness of San Vicente del Barco, a wealthy with a list of titles herself, Cayetana grew up in her family's art-filled palaces, castles, country houses and estates across Spain. While living in London during the Spanish Civil War, Liria Palace was essentially gutted by the fire that resulted from a bombing. 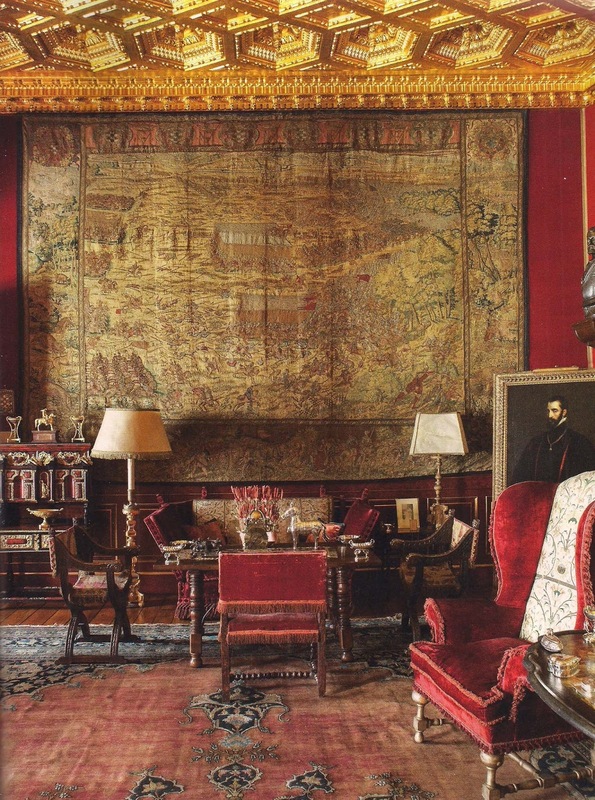 Fortunately, the most important art works had been sent to the British Embassy in Madrid and to the Banco de Espana. And the Gobelin tapestries had been sent to the Real Fabrica de Tapices for cleaning and restoration. 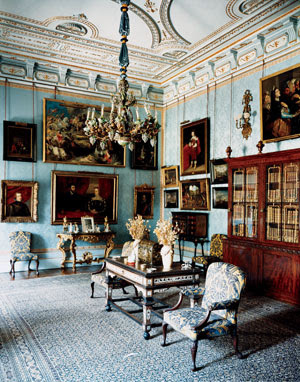 James Fitz-James, the Duke of Berwick, settled in Spain in the early 18th century and was the first owner of the Liria Palace; his descendants completed the palace, described as the most elegant in Madrid, at the end of that century. 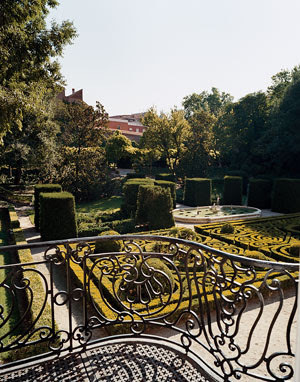 The Garden Elevation of Liria Palace, Madrid. When the previous Duchess Cayetana, a widow and muse of the artist Goya, died without children at age 40, the palace passed into the Alba family via a nephew. 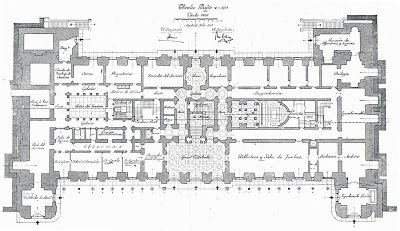 The Attic Floor Plan, Liria Palace. 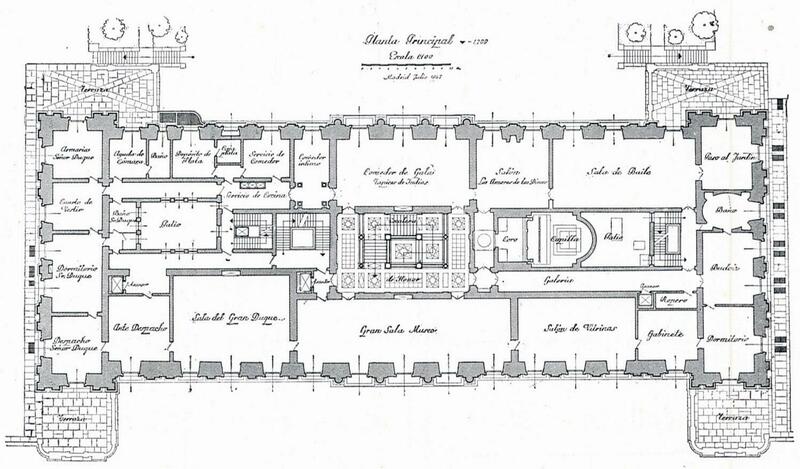 The Second Floor Plan, Liria Palace. 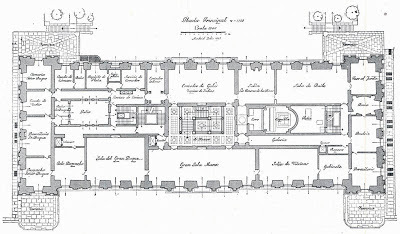 The First Floor Plan, Liria Palace. 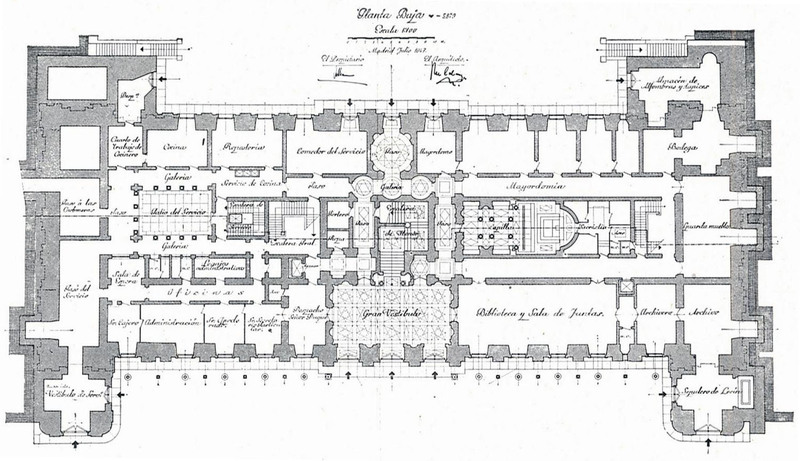 The Ground Floor Plan, Liria Palace. 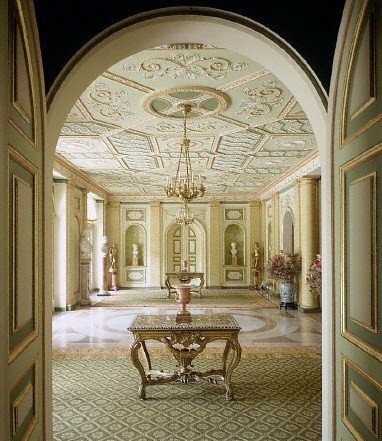 The duchess's father, the Spanish ambassador to Britain after the Civil War, was familiar with the great architect Edwin Lutyens from some of the earlier work at Liria and hired him to design the reconstruction of the palace. A section through Liria Palace, Madrid. 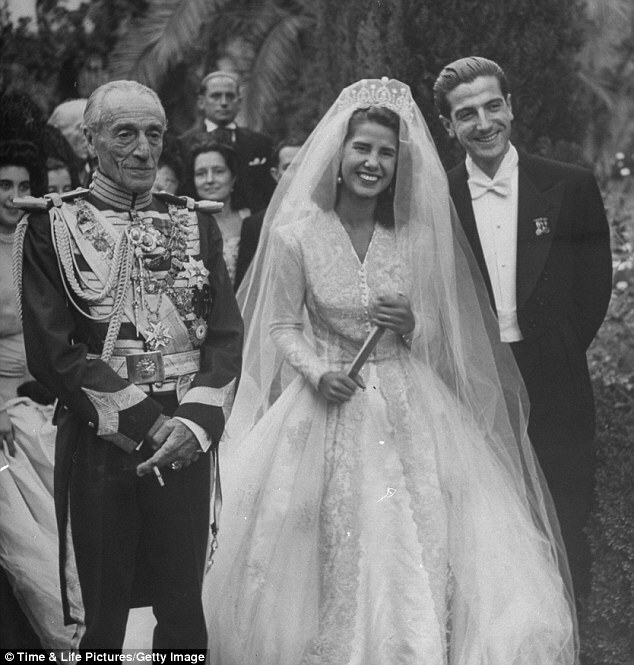 The first wedding of the Duchess of Alba, 1947. The groom was Don Pedro Luis Martinez de Irujo y Artocoz. Photo: Time Life Pictures, Getty Images via Daily Mail. 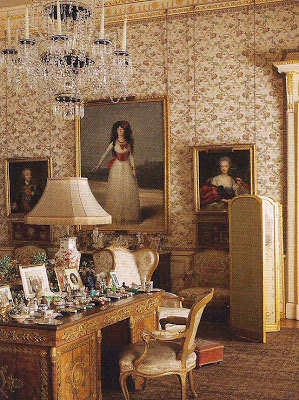 The duchess writes in her memoirs YO, CAYETANA (sadly, available only in Spanish) that she developed a passion for decoration and antiques after visiting so many beautiful houses when she lived in England and the house of her godmother, Queen Victoria Eugenia of Spain. Her first husband, Luis Martinez de Irujo (son of the Duke of Sotomayor), shared this passion and helped in rebuilding the palace. The marriage was a great union of Spanish noble families and was reported by The New York Times as "the most expensive wedding of the world." Six children were born before Martinez's death in 1972. 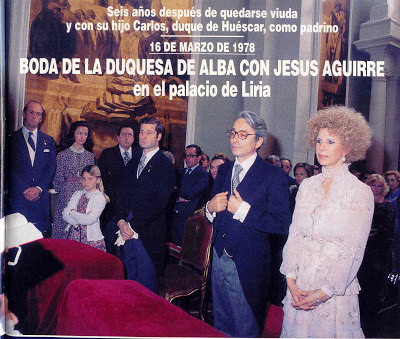 The second wedding in 1978. The second marriage caused some controversy as the groom, Jesus Aguirre y Ortiz de Zarate, was of illegitimate birth as well as a defrocked Jesuit priest. But the marriage was a happy one, by all accounts, ending with his death in 2001. 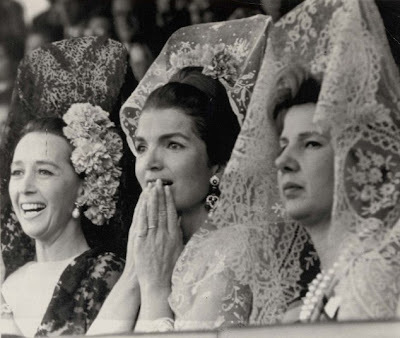 Secure in her great wealth and social status, the Duchess of Alba was unconcerned about the public shock of her third marriage that was widely covered in the European tabloids. The third wedding in 2011. The groom was Alfonzo Diez Carabantes. Photo: Associated Press via Daily Mail. Legal paperwork restricting inheritance and a distribution of wealth and property prevented an outrage from her children, according to sources in the press, after the duchess' marriage to Diez Carabantes, a long-time friend almost 25 years her junior. is said to be the largest in Madrid. Photo by Simon Watson for W magazine, 2005. There are four floors of the palace with the ground floor containing offices, studies, the library and archives, and the music room. The Entrance Hall of Liria Palace. 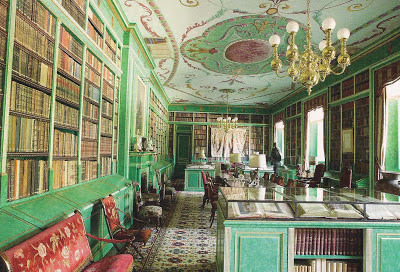 The Library of Liria Palace. 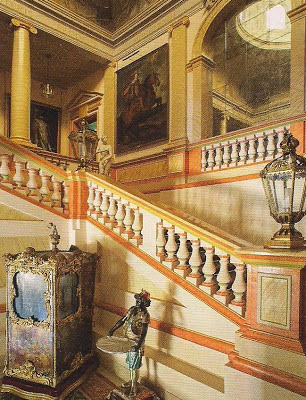 The staircase at Liria Palace. was designed by Edwin Lutyens. 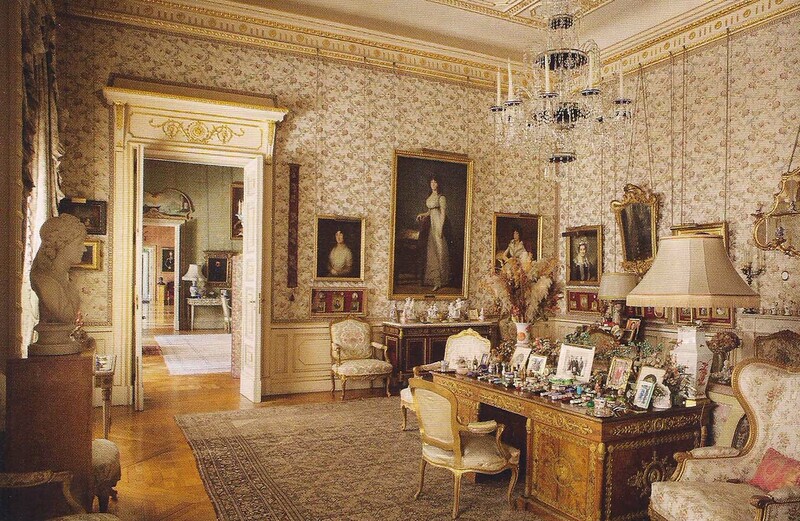 The first (principal) floor has all the reception rooms, the dining room, and the duchess's own rooms. American Vogue via Scala Regia. "The Duchess of Alba in White"
by Francisco de Goya, 1795. Photo by Ricardo Labougle for World of Interiors. The other end of the Goya Room at Liria Palace. Marchioness of Lazan" by Fracisco de Goya about 1804.
one by Augustin Esteve (left) and Joaquin Inza. hung with tapestries depicting battles. 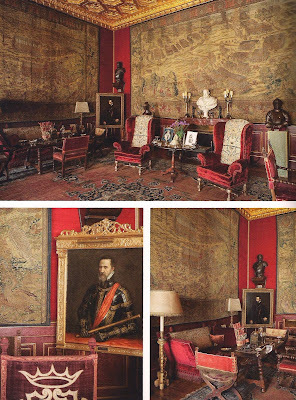 with two portraits of the Grand Duke of Alba. himself, lower left, painted about 1570. The Dining Room at Liria Palace. 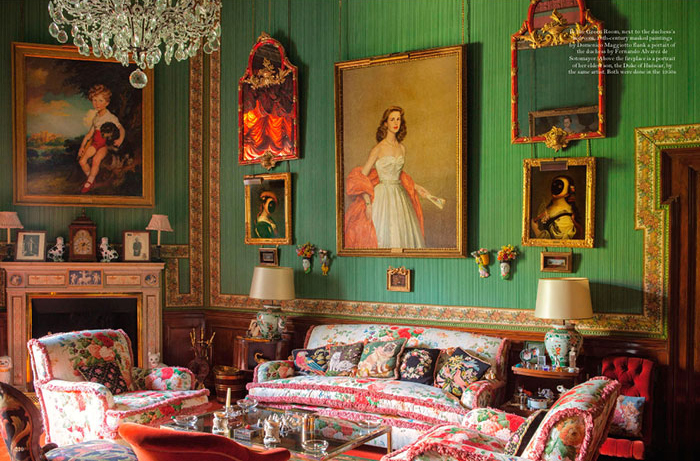 The Green Room is next to the duchess's bedroom. 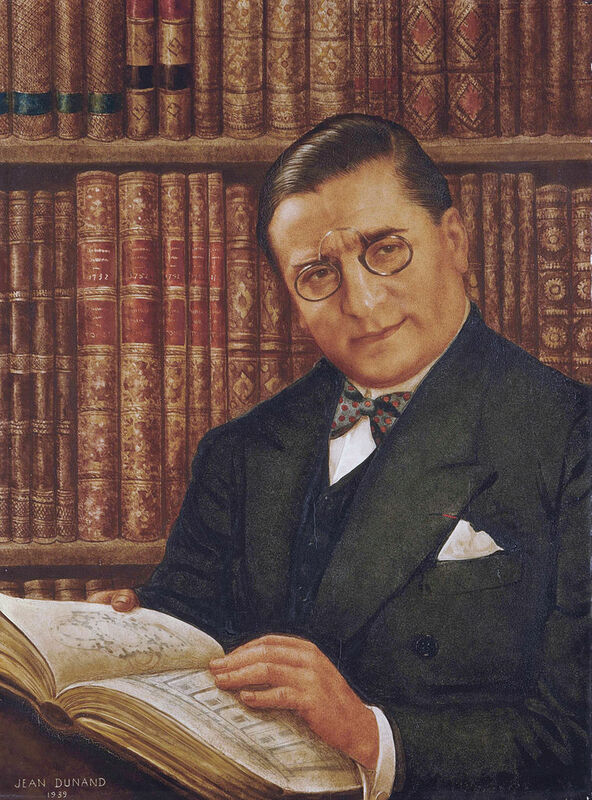 the Duke of Huescar, were painted in the 1950s. The Blue Sitting Room at Liria Palace. Photo by Simon Watson for W magazine. 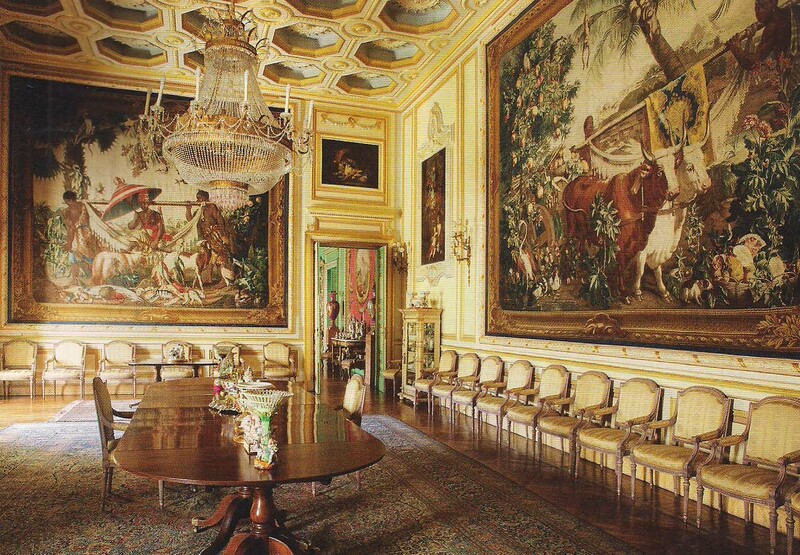 The Flemish Salon at Liria Palace. The Spanish Salon at Liria Palace. The second floor has the private sitting rooms and some of her six children have private apartments there as well. The third floor has servants rooms, the studio where the duchess used to paint, and a room that houses the collection of royal uniforms. 1882 to 1938 in a portrait by Jean Dunard. 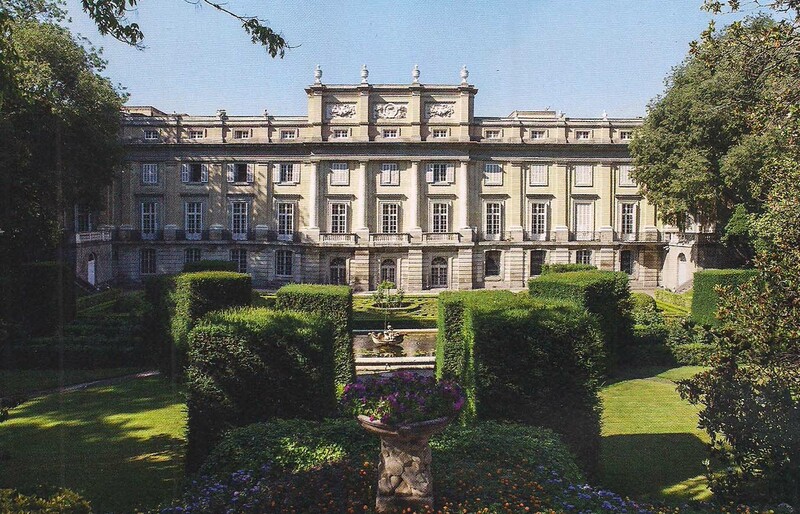 Liria Palace has been in the news again lately with the publicity surrounding an auction at Chrisitie's Paris on May 23, 2013. 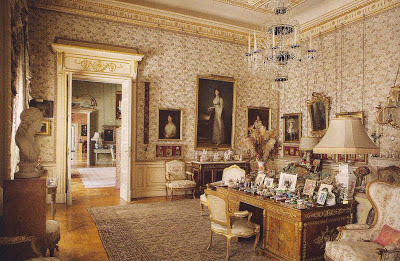 Some Art Deco masterpiece furnishings designed by Armand Albert Rateau for a suite of private rooms for the Duchess of Alba, dona Maria del Rosario de Silva y Gurtubay, the mother of the current duchess, were sold to raise cash for the House of Alba. 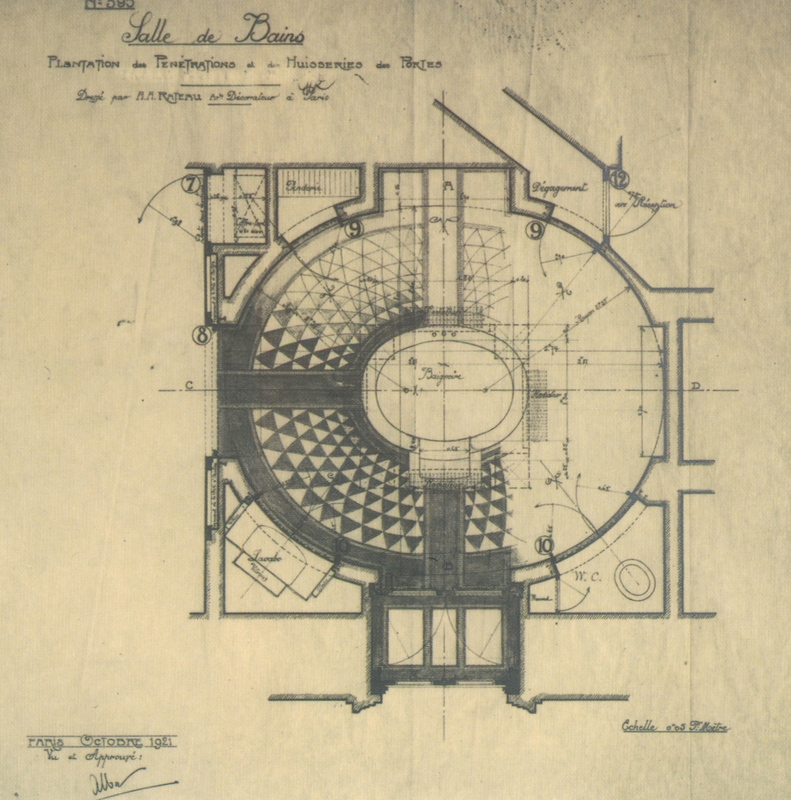 Rateau's 1921 plan of the bathroom. 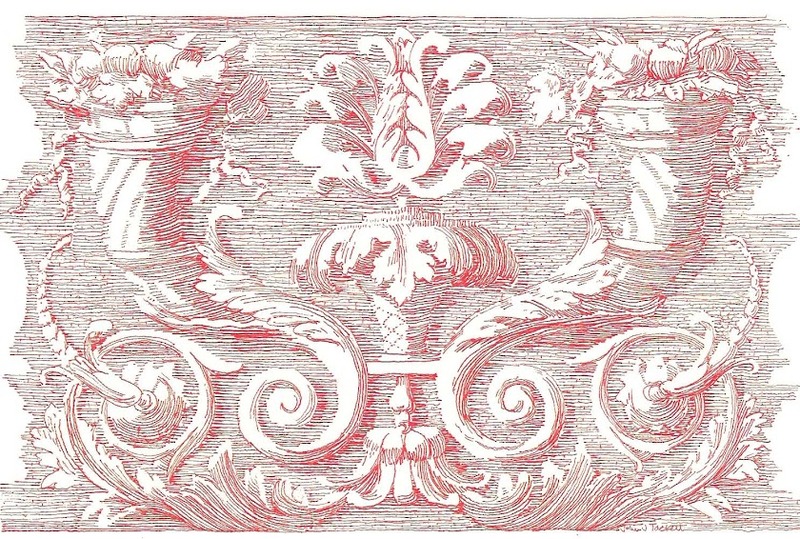 The House of Alba issued this statement regarding the sale of furnishings that the decorative arts community had been presumed lost in the bombing during the Spanish Civil War. "The House of Alba has decided to sell the Armand Albert Rateau furniture commissioned by the 17th Duke of Alba, don Jacobo Fitz-James Stuart in the early 1920s in France, in order to support the funding of its heritage and of its various palaces throughout Spain as well as supporting projects of the family. 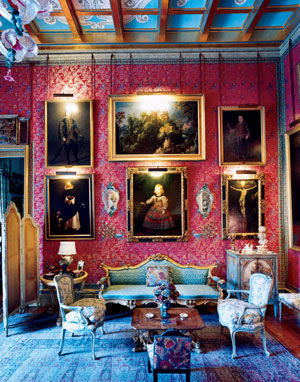 This is part of a general reorganization undertaken by the House of Alba, as illustrated by the recent exhibition 'El Legado Casa d'Alba', the first ever organized in Madrid between December 2012 - March 2013. These pieces of furniture are all that remains of a larger ensemble that no longer exists. 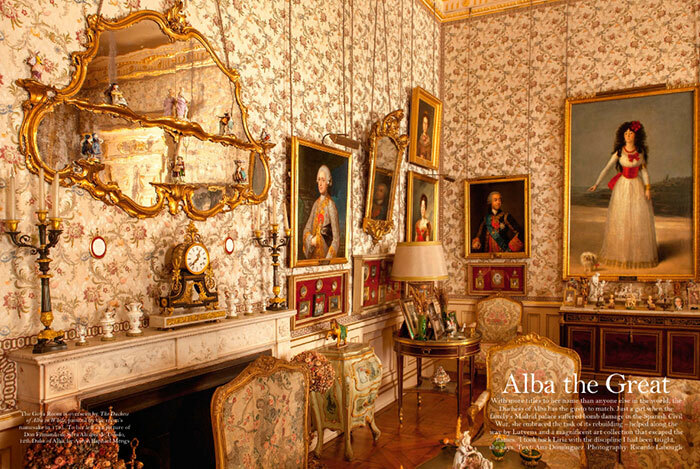 They do not form part of the historic collection of the House of Alba nor do they relate to the history of Spain". sold at the Christie's Paris auction. Despite the missing mirror and some other replacements, the coiffeuse (lot 123) in the niche brought $854,696. The lit de repos (lot 118) placed before it, brought $544,602. Of the magnificent torcheres which were originally a set of four, two lampadoire aux oiseaux (lots 119 and 120) were sold for $2,151,953 each. 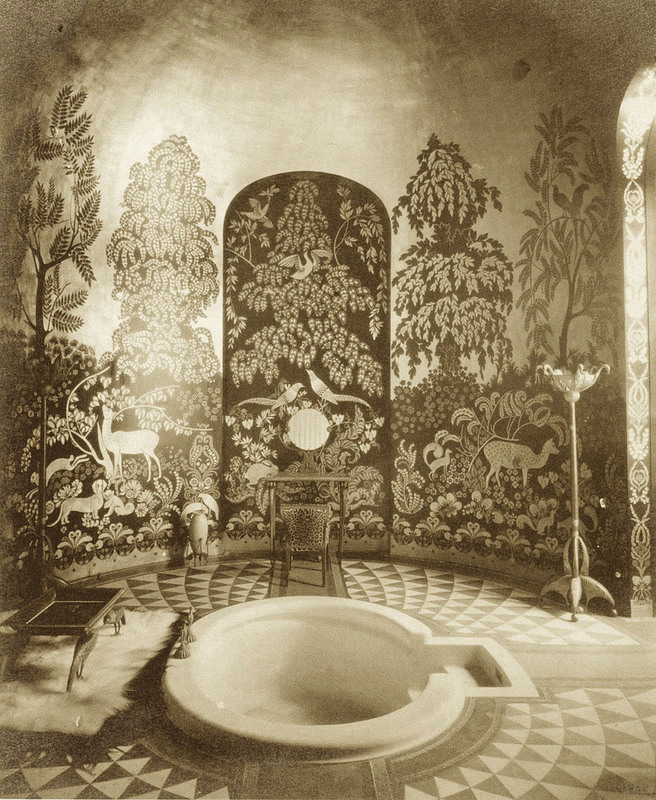 The table basse aux oiseaux (lot 122) shown at the left of the sunken bathtub sold for $2,151,923. All these were within the estimated price range. The baignoire (lot 124), the enormous marble bathtub, sold for $79,462, well below estimates. The canapé (lot 121), not seen in the photograph above, which had restorations and losses, did not sell. 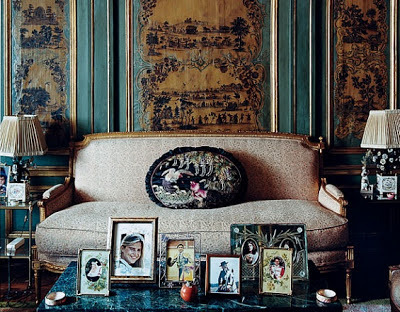 For more about the history of these noteworthy rooms created by Rateau, see the posts of the always interesting blog Aestheticus Rex here and here. And for highlights of the sale, see the post by everyone's favorite Mitchell Owens for the on-line version of Architectural Digest here. For those reading via an e-mail subscription, visit the web version of The Devoted Classicist for a variety of extra features such as Comments, Popular Posts, Blog Archive, and Search This Blog. Thanks to Xudros whose comment was readable but too technically compromised to publish (at no fault of the writer). There was a misidentified photo of the duchess, in her palace in Seville, rather than Madrid. I appreciate the notice. That is one face lift that went terribly ,terribly wrong! Beautiful palace with beautiful merchandise..................sad it had to be sold. L.C., at first I thought the sale was a bad idea. 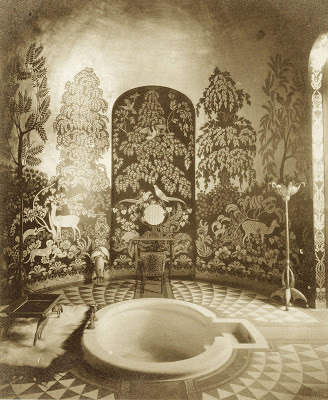 But it was just those few items and the architecture and decoration of the bathroom apparently no longer exists. So I think it is better to let someone else enjoy them for a while. It will be interesting to see if anything shows up in a museum's collection or if the furnishings stay in private hands. Yes, I misunderstood that the sale was a much bigger one, to assuage the anguish of the children and their potential loss of inheritance. The palace would make a remarkable museum, as most people choose not to live this way anymore, but I suppose that will be decided by the principal heir/ess. I understand that Liria Palace is occasionally open to the public to some extent. Now that that some of the six children even have grandchildren, one could see that the palace could be more filled than at first imagined. Thanks for commenting. A.R., thanks. I look forward to your post. John, Thanks so very much for linking to my blogpost. Much appreciated. Pity that Lutyens redesign of the private rooms did not attempt to recreate, in some fashion, the Rateau suite. The rebuilt in that area could not have been more prosaic. 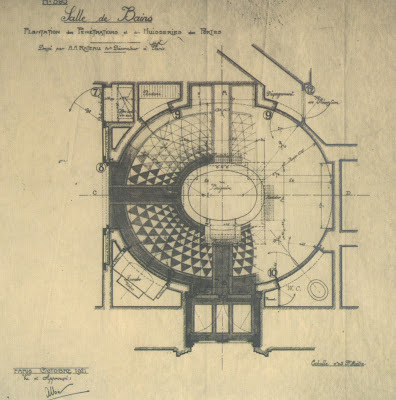 Mitch, Lutyens had done many bathrooms that were far from commonplace, so maybe the difference came with what he had suggested and what was built under the direction of others. I would have thought he would have loved the central sunken tub and that fantastic floor. As for the furnishings, tastes change and I am sure there are many even today that would consider the Rateau-designed pieces monstrosities. The re-created Lanvin bathroom at the Musee des Arts Decoratifs has also been a favorite period room exhibition, so I was intrigued to learn that there was once one similar and perhaps even better. If you find out who bought these furnishings, I hope you'll let us know. Sergio, I read your comment, but I am sorry that there was a complication and it was not published. I apologize, but it is something that happens on occasion. I am glad you enjoyed the floor plans. I always try to include them when possible. I first published just the principal floor, all that I had, but immediately got a direct email from T.B., one of my Devoted Readers who offered all seen here plus the exterior elevations and section. So I immediately edited the post to add them. There are more floor plans of other interesting residences to follow, so I don't think you'll be disappointed. Thanks for your comment, and again, I apologize that it could not be published. 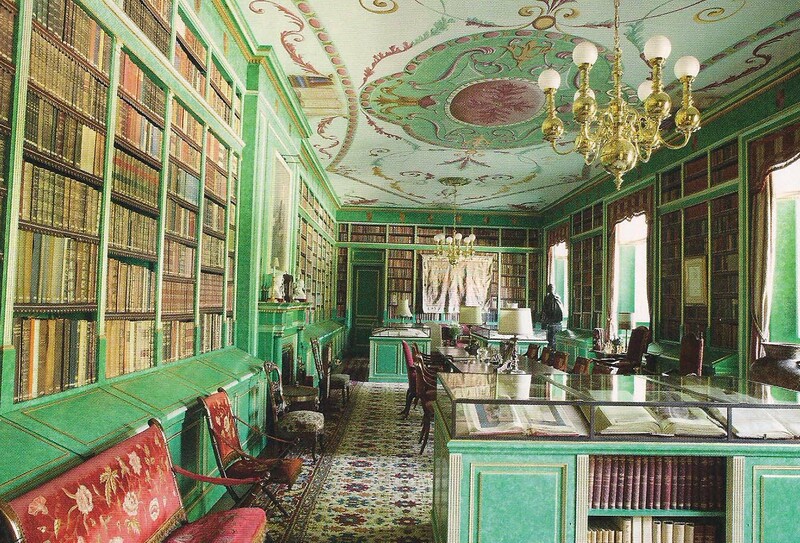 What an incredible palace, and I do see the English influence in the interiors. I'm glad you shared this with us, John, it is truly magnificent and in perfect taste. One room is as lovely as the next. I'm also glad that they were able to add to the restoration coffers with the proceeds of the auction. I can't imagine the cost of maintaining such a residence. L., fortunately there is still a good bit of cash in addition to the treasures. But yes, I am sure the expenses mount quickly. Thank you for commenting. The palace is open by appointment only and not to "everybody". I have not been but a close friend has. One of these days you must feature Las Duenas, her palace in Seville where she got married. I saw a documentary in Spanish tv a long time ago on her life. The Liria Palace was quite extensively damaged during the Civil War and she undertook the rebuilding by selling other properties, art and what not. They did not find much left on their return. Quite a woman... though she should have gone to a better plastic surgeon! the plastic surgery is heartbreaking. Truly. this was a beautiful woman who could have aged beautifully. with the correct doctor. Heart-rending. so so sad. How do you make an appointment to tour the Palace? David, to see if a visit may be arranged, go to the website of the palace's educational foundation: www.fundacioncasadealba.com and make a request.